A project plan is a key ingredient to deliver a successful project since it allows you to create a shared sense of purpose and it makes it clear to the project team what it is set to do, by when, and in which order. Instead of a mere vague dream, a project plan instills action, emphasizing deliverable and work packages required to achieve the project milestones. 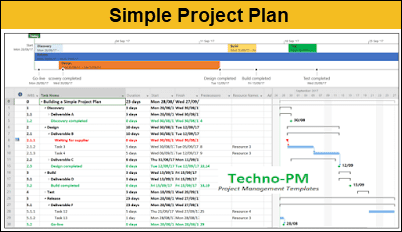 How to create a Simple Project Plan? Projects follow a certain structure or hierarchy of decomposition which, in project management terminology, is called a work breakdown structure, where work is broken down until the lower level of detail, a work package. If you have a project management methodology in place, start by listing the key stages that compose it. For the matter of simplicity, let’s use the example of a project following the waterfall method, where the project only proceeds to a stage upon successful completion of the previous stage. This would mean, for instance, having Discovery, Design, Build, Test, and Release as your key stages for a typical IT project. The next step is to decompose these stages in products (your deliverable) and identify which tasks are to be done to achieve each of them, using indentation to form groups. There, you have your WBS. I’ve seen it happening often, project managers who want to micro-manage it all thus build their plans with too much granularity as if it was a to-do list. 100% rule - If it is part of the project, it should be in the plan; if it is not in the plan, it is not part of the project. Simple, right? It will help you define and stick to your project scope. 8-80 rule - Is it is less than 8 hours of effort, it is too granular to include in the plan; it is more than 80 hours of effort, it is too big of a task to manage and it should be decomposed further. While this is just a rule of thumb (please remember to use common sense too! ), it will help you get the right balance when it comes to detail. Milestones and constraints are tasks with zero days of duration/effort. Milestones refer to checkpoints and achievements, such as the end of a stage or the go-live for the project; they are a result of a set of tasks. 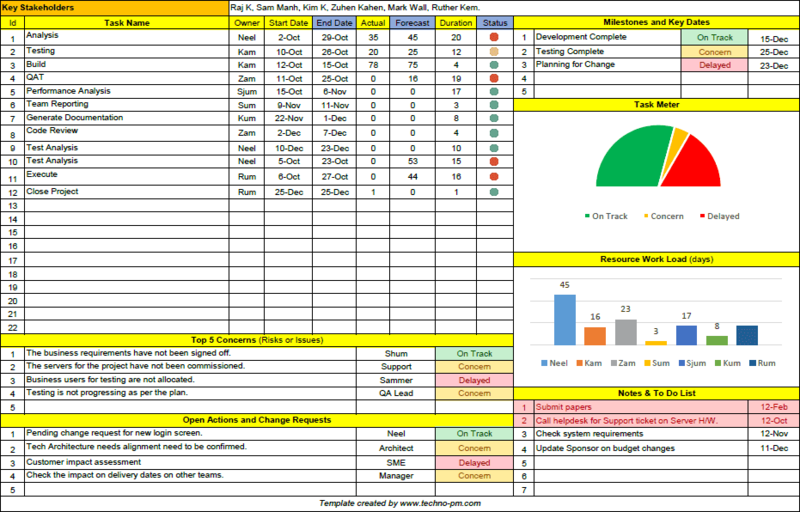 Have a look at project milestone template before you use project plan template. Constraints, on the other hand, work as an input in the way that they impact the start date of a certain task; a typical example of a constraint is when you are waiting for a delivery from a supplier. Once all the key elements of the schedule are identified, it’s time to set your dependencies, aka, predecessors. This will establish the order in which tasks should be completed and will form the network path for the project. Don’t try to manipulate dates by using a calendar picker just because you can! You should use duration to mold finish dates and predecessors to mold start dates. Next step is to define how long is each task is going to take, both in terms of duration and in terms of work, which are two different concepts although related. After, resources – either human, material, or costs resources – should be added to each task, so that responsibility for their completion is defined. Look at the plan as it stands; is the current finish date in line with what was agreed? What about cost? Before committing to the plan, take a moment to check your critical path, that is, the path formed by tasks without any float meaning that if any of them is late, your project will be delayed. Are there opportunities to optimize the project plan, such as shortening duration by doing some tasks in parallel or by adding more resources, or replacing costly resources with more cost-effective ones? Once you are happy with the plan, meaning that it has been optimized and it suits the expectations of the project stakeholders, you are ready to set the baseline. Going forward, in execution mode, your baseline will be used as the reference point to check if you are on track or not. It is a commitment towards the project. The Template contains Task No, Task Description, Owner, Start, Finish, Progress, Status, Risks/Issues, and Comments columns. Task No should be sequential 1 for the main and 1.1,1.2,1.3 for subtasks. Task Description can the task name. Use short informative descriptions. If you need more information you can add in the comments column. The Owner can be the name of the person or the team who owns this task. Start and finish are self-explanatory. Progress should have a % complete for the task. Status is the what is the status of the task. I will suggest the following statues – On Track(Green), Concern(Amber), Delayed ( Red), Complete (Blue), Pending is white. Risks/Issues column should be used to document issues related to that task. As a thumb rule, any task that is in Concern or Delayed status should have something in risks/issues column to explain why the task is the current status. The comments column can be used to provide basic information about the task. Examples like “Funding Approved by Finance”, “ Reminder sent” etc. 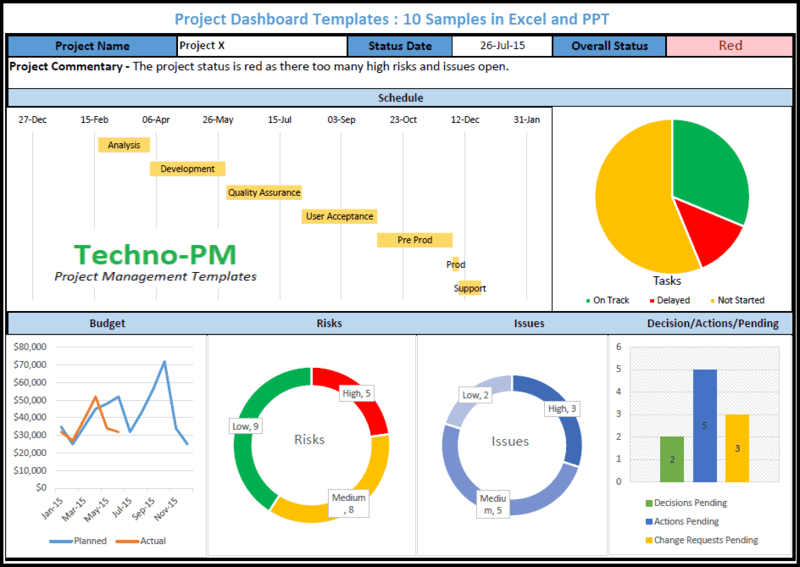 The example project plan included with this article is a generic project plan which can be used for software development. The plan has been divided into several phases – Project Initiation, Analysis, Design, Development, Testing, User Acceptance, Deploy and Go Live. The project initiation phase covers all the tasks required to get the project started. Tasks like business case approvals, funding approvals, resource planning, schedule planning and arranging kick of meetings. The analysis phase contains drafting business requirement, functional requirement and technical requirement specifications which are required to ascertain the scope. Walkthrough and sign off tasks are required to make sure that everyone is in on the same page. In the design phase, it is generally the architect who comes with the high level and low-level design document to address the function and technical requirements as specified in the analysis phase. In the development phase, you would generally have tasks which will be meant to build the system. A developer will start with the development tasks and will do the unit testing. At the end of development before starting testing integration testing needs to be done. The main objective in the testing phase of the project is to make sure the software deliverable are of good quality. Testing in a project involves creating a test plan and test cases. Execute the test cases and record defects. There should be some time allocated to fix the defects and then retest the defects. User Acceptance phase is required to make sure that the software developed is in line with business acceptance. In the user acceptance phase(a.k.a UAT) the business users will create test cases and test the system. Generally, the UAT is not as elaborate the testing or QA. Deploy or also known as the implementation phase is used to deploy the software that was built. It involves planning, practicing and deploying applications into live or production environments. Go Live the step where the system is live and is being monitored to see if any issues arise due to the latest changes. After the go-live the project can be formally closed. 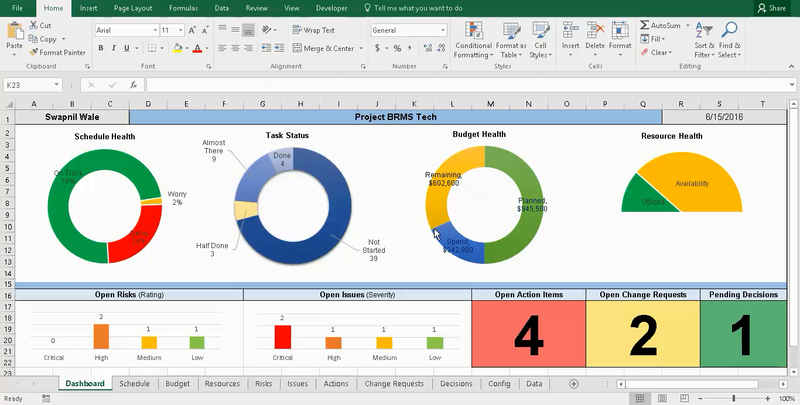 The template does not support multiple project tracking. You can also have a look at how you can use timeline for tracking.